WorkFaith Connection and Gallery Furniture can help job seeker be successful! In post-Hurricane Harvey Texas, Gallery Furniture is committed to bettering the lives of individuals who have and have not been impacted by the devastating affects Harvey has had on communities across Texas. In collaboration with The WorkFaith Connection, Gallery Furniture seeks to help individuals find the resources and training they need to learn the job skills that will lead them to a brighter future. 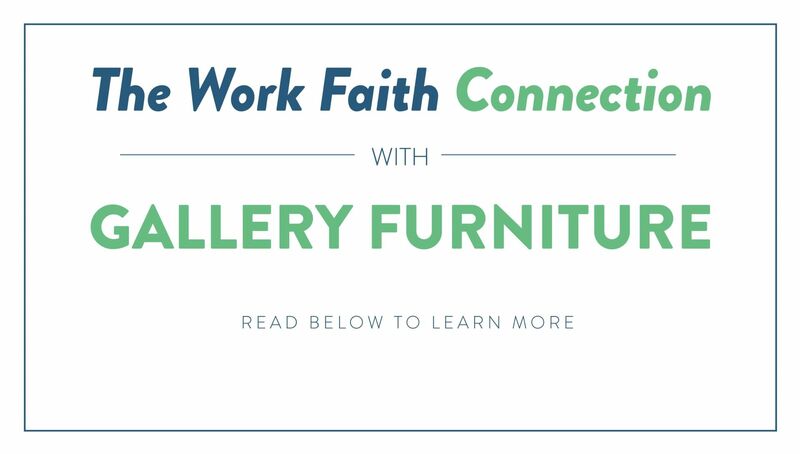 If you are interested in The WorkFaith Connection’s Job Readiness Program, please visit our website here to read more about Gallery Furniture’s partnership, and the upcoming orientation dates scheduled for our 6006 North Freeway showroom: https://www.galleryfurniture.com/gf-job-program.html. The WorkFaith Connection's mission is to help people in transition build a new life through work and faith. WorkFaith is a Christ-centered organization that exists to encourage job seekers in their hope for a better future and to equip them with the skills and beliefs to gain employment and lead healthy, productive, and spiritually rich lives. WorkFaith Connection has been serving Houston for more than 10 years and is one of the city’s largest job search training programs. 76% of the graduates find jobs after the program, most within the first 90 days. The program consists of an 8-day classroom training program where students will learn how to effectively fill out job applications, answer tough interview questions, highlight their strengths and abilities, and identify the hidden job market. After the training program, each graduate is assigned a job coach to guide them through the job search process. Individuals with felony records are eligible for application. Many of WorkFaith Connection’s participants will have faced obstacles in finding employment, such as being laid off after long-term employment, re-entering the job market after a major life change, transitioning from prison, recovering from addiction, or simply looking for some hope after searching for a job for an extended period of time. WorkFaith Connection teaches participants how to approach these obstacles with prospective employers and how to communicate that these obstacles do not define them or their abilities. All of us here at Gallery Furniture wish you all the best, and may God bless you!